ISO 9001:2008 is the latest version of the Quality Management Standard that helps organizations achieve standards of quality that are recognized and accepted throughout the world. 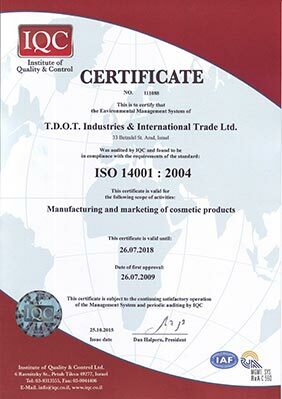 ISO 14001:2004 is an Environmental Management Standard, whose purpose is to ensure that manufacturing is conducted while protecting the environment, preventing pollution and improving overall environmental performance. 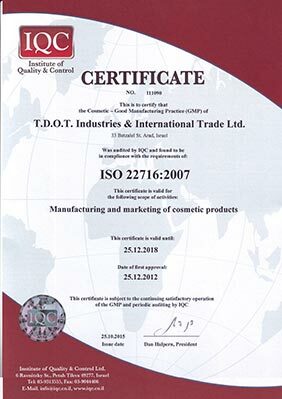 ISO 22716:2007 replaces the former GMP (Good Manufacturing Certificate) and gives specific guidelines for the production, control, storage and shipment of cosmetic products. 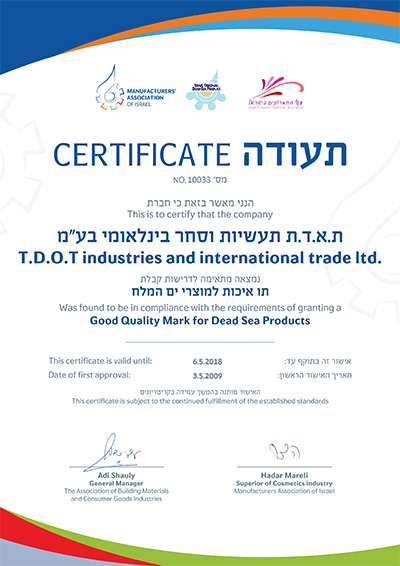 Israeli Cosmetics Industry Association - Good Quality Mark awarded for excellence in the manufacture of cosmetic products. T.D.O.T. 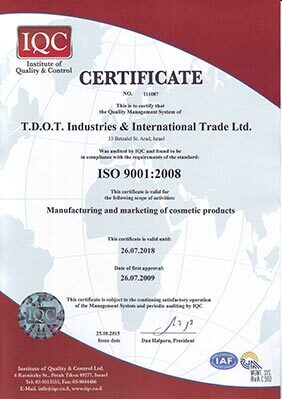 Industries & Int'l Trade Ltd. is committed to the pursuit of excellence in the manufacture of skin care cosmetic products based on the unique ingredients of the Dead Sea. Our emphasis, as always, is to continue to strive to provide the highest levels of product innovation, quality & customer satisfaction and we look forward to being of service to you again soon. Attached, you will find copies of the certification for your reference. Please click on the certificate to enlarge.